This is the 14th square of the 30 square Knitterati Afghan. The afghan commemorates Cascade Yarns® 30th anniversary. The 30 squares will be released throughout 2017 as a mystery knit-along. Cascade Yarns® will be making a donation to Project Linus equal to the amount that it receives from Ravelry for the sale of this pattern. Project Linus is dedicated to providing love and warmth to children in need. These are children who are seriously ill or traumatized by a disruption in their life. Project Linus does this through gifts of new handmade blankets and afghans. Local chapters hand knit, crochet, or sew blankets. The blankets are collected and donated to local hospitals and shelters for use by children. Making the blankets enriches the lives of the volunteers who craft them, by offering a rewarding and fun service opportunity. To date, Project Linus has donated nearly 6,350,000 blankets to children in the United States. Donations to Project Linus are tax deductible as it is a 501c3 organization. For additional information, please visit www.projectlinus.org. 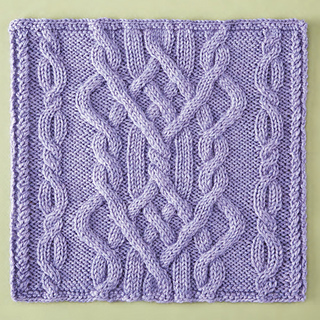 These Celtic-inspired cable patterns bring out the beauty of this lavender shade. US 7 (4.5 mm) knitting needles, OR SIZE TO OBTAIN GAUGE. 28.5 sts x 29.5 rows = 4” (10 cm) over chart using size 7 (4.5 mm) needles. For additional help with Block 14 with tips and videos visit: Cascade Yarns® Block 14 Project page.